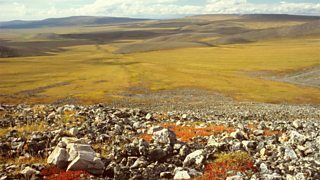 Tundra is a biome where the ground stays frozen for most of the year and there is very little precipitation. Learn more about the location, climate, soil and adaptations of this biome. Tundra areas include Northern parts of Canada, Russia and Alaska. is gentle, mainly falling as snow. The winds can be very strong. Summers may have many hours of continuous daylight. Winters are long, dark periods. The climatic conditions mean that the landscape is quite bare, with little vegetation.